Anmerkungen Eine abgespeckte Version des Spiels ist auch auf der Nintendo PlayChoice Arcadeplattform erschienen. More magic, more profit than you ever imagined! 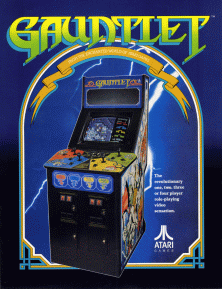 GAUNTLET incorporates many of the attractive characteristics of today's popilar fantasy role-playing games. The medieval theme provides an exciting setting for players to act out fantasies of non-stop combat and conquest. Gauntlet is a revolution! It's a new multiple-player add-a-coin concept that brings operators maximum earnings power. Up to four players can play at the same time. New players can enter a game in progress at any time. The Heroes: THOR, the Warrior, THYRA, the Valkyrie, MERLIN the Wizard, QUESTOR the Elf. The Villains: Ghosts, Grunts, Demons, Lobbers, Sorcerers, Death, The Thief. The action begins as the player(s) choose a character to portray and enter the game by depositing the correct amount of coins in the slot corresponding to each of the four heroes. Erach of the four characters has many unique capabilities. For example, THYRA the Valkyrie has strong armor, THOR the Warrior is skilled at hand-to-hand combat, QUESTOR the Elf has the fastest speed, and MERLIN the Wizard, the best magic. Super fast action play stresses cooperation. The object of the game is to survive the monster attacks for as long as possible while competing for food, treasure and magic potions. 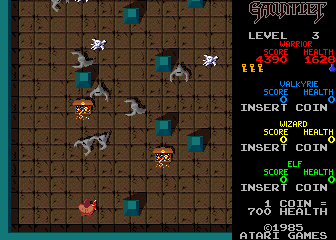 Players must also search the maze to find the exit to the next level. Playing as a team gives players the best chance for survival. How long a player lasts depends on the player's "health". Health is lost by contact with the monsters and as a function of elapsed time.